Lexton is a small rural township on the Sunraysia Highway, 45 km north-east of Ballarat. It is situated in country described by the New South Wales Surveyor-General Thomas Mitchell, as a ‘valley of the finest description’ (1836). Several creeks descend from foothills of the eastern Pyrenees of the Great Dividing Range, the main one being Burnbank Creek, which runs northwards into the Loddon River. Pastoral runs were taken up around Lexton during 1838-41. It appears that squatters’ tracks intersected at about the location of Lexton, first known as Burnbank. A general store, inn and blacksmith were established in about 1845. In 1851 a township was surveyed, expressed as ‘Lexton – at Burnbank’. The inspiration for the name is uncertain. 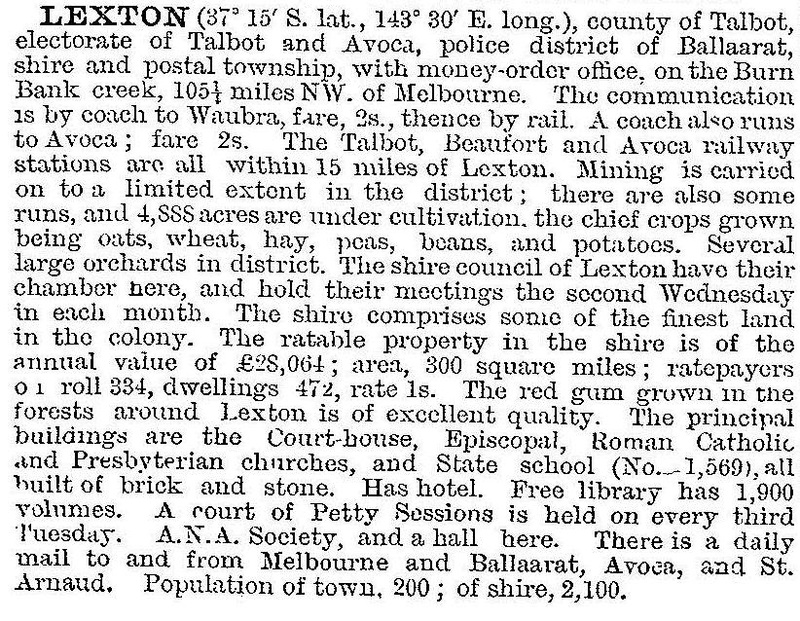 As Lexton preceded the formation of townships at Ballarat and other goldfields, it became an administrative and legal centre by 1852, with a post office, court house, police post and an animal pound. There were diggings all around Lexton, but no gold was mined there, and Lexton was to depend on steadier agriculture and grazing for its future. A Presbyterian school was opened in 1855, and a Presbyterian church in 1857. Lexton shire was mainly agricultural and pastoral, except for the Waterloo gold diggings on its south-west boundary, Caralulup on its north-east boundary and Amphitheatre and Glenpatrick near its northern boundary. In the south of the shire were two notable pastoral estates, Mount Mitchell and Ercildoune. The homesteads of each are registered historic buildings. Of the two, Ercildoune is the more extravagant, built of granite in a two-storey Scottish Baronial style by the Learmonth family during the 1860s. The Langhi Kal Kal estate, west of Ercildoune, was subdivided for soldier-settlement farms after World War II, and the homestead and 2000 ha kept for a training prison for young male offenders . West of Lexton there is Mount Lonarch and other dividing range summits. Watercourses descend south and north: those north feed the Wimmera and Avoca Rivers, and Bet Bet Creek which enters the Loddon River. To the south the Trawalla Creek joins the Mount Emu Creek which ends in the Hopkins River, near Warranambool. 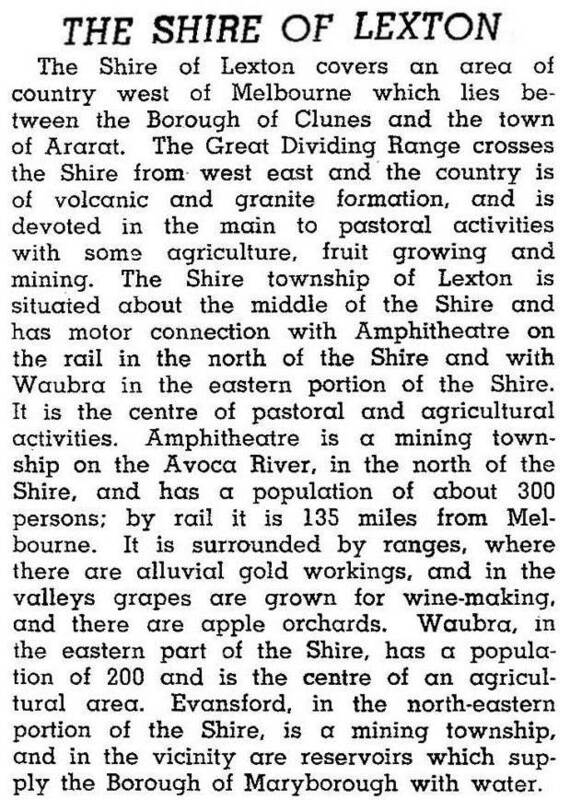 The Lexton shire has had a maximum population of about 2100 people, falling to a low point of 1152 in 1981. The population change coincided with the move from crops to sheep grazing, although potatoes continued to be grown. In 1994 farming occupied 72% of the shire’s area of 821 sq km, carrying 279,000 sheep and lambs. On 20 January 1995, Lexton shire was united with virtually all of Avoca and Ripon shires to form Pyrenees shire. Lexton township has a school (1875), Anglican, Catholic, Presbyterian and Uniting churches, a public hall, a general store, the Pyrenees Hotel (1859), a golf course and a recreation reserve. The shire offices became a rural transaction centre.